ForTechiesOnly: My first blogpost on Skyfire's blog. give it a read. My first blogpost on Skyfire's blog. give it a read. 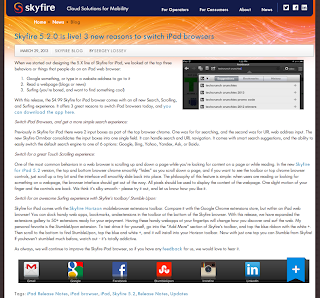 The post is about a new version 5.2.0 that we just released for Skyfire for iPad. to buy it for $4.99 or get the update for free if you already have Skyfire for iPad. P.S. Check out the Skyfire Horizon extension gallery, there are 50+ mobile browser extensions to test drive. My personal favorite is the new Stumble Upon extension.